Situated at an altitude of 1,457 m, Dharamshala holds great appeal for those with an appreciative eye for exquisite beauty. A drive to this hillside town through dense growth of stately deodar, conifer and pine forests is a bewitching experience by itself. The stunning landscape of Dharamshala, whose claim to fame lies in its being the seat of Tibetan exile administration, offers some of the most exciting outdoor pursuits such as walks and treks into the lofty Dhauladhar range. 4km north of Dharamsala, is located McLeod Ganj, residence of His Holiness the 14th Dalai Lama and a crucible of spiritual seekers, buddisht monks and Tibetan community. During the Chinese oppression of Tibet in 1959, the Tibetan refugees crossed over to India along with the Dalai Lama. Administrative Headquarters of the kangra district Dharamshala can be used as a reference point for visiting some of the finest excursions sites like Kangra, Jawalaji Temple, Brijeshwari Temple. Chamunda Devi and Chintpurni shrine. Famous Tibetan institutions have lent importance to McLeod Ganj. A Buddha temple is situated opposite the present abode of His Holiness, the Dalai Lama and around it are situated a Tibetan monastery and nunnery. The Tibetan Institute of Performing Arts (TIPA) preserves a number of musical, dance and theatrical traditions of Tibet. The tranquility of the laidback villages of Bhagsunag (Bhagsu) and Dharamkot will offer you peace of mind. The 16th century Shiva shrine, the Bhagsu Lake, Gallu Devi Temple are the main attractions here. Dharamkot commands a stunning view of the Kangra valley and is the starting point for many wonderful treks to the Dhauladhar ranges. Located in Kotwali Bazaar, Kangra Art Museum is a repository of arts and crafts of the Kangra Valley’. The world renowned Kangra’s miniature paintings are on display in the museum. 10km from Dharamsala, the ashram complex set up by Swami Chinmayananda is located .on the banks of Bindu Saras. Located in the valley below Dharamsala near Siddpur, the Norbulingka Institute was built in 1988 with a view to preserving the traditional arts and literary studies of Tibet. Built in the traditional Tibetan style, the institute is home the Seat of Happiness Temple containing astounding murals and the Losel Dance Museum. It also has the Norling Guest House. Set amidst the deodar forests between McLeod Ganj and Forsyth Ganj, the monument was built in neo-Gothic architecture. In the courtyard of the church is buried Lord Elgin, one of the Viceroys of India. Nerve center of McLeod Gan, Thekchen Chöling Temple Complex comprises Tsuglakhang temple and Namgyal Monastery. Tsuglakhang temple, the Dalai Lama's residence, is the replica of the original Tsuglakhang in Lhasa. The Namgyal Monastery houses a 1,500-year-old statue of Guru Padmasambhav, and a life-size idol of Avalokiteshvara. Photography not allowed in the Namgyal Monastery. Located in the heart of Mcleod Ganj town, Namgyalma Stupa is a memorial to the Tibetan soldiers, who died fighting in their homeland. This Buddhist structure resembles the one built by the Mauryan emperor Ashoka in the 3rrrd century BC. 16 km from Dharamshala, Chamunda Devi attracts thousands of devotees from all over Himachal Pradesh. 18 km from Dharamshala, Kangra is known for its temples and fort. The most notable temple is the shrine dedicated to the goddess Brajreshwari. Kangra is also renowned for its miniature paintings. 35 Km from Dharamshala, Palampur is located at an elevation of 1219 metres in the Kangra valley. It is set in an incredible landscape. 56 Km from Dharamshala, the famous shrine of Jwalamukhi is one of the most popular Hindu temples in India. Other shrines near the Jwalamukhi shrine are Nagini Mata temple, the Ashtabhuja temple, Shri Raghunathji temple and the Chaumukha temple. 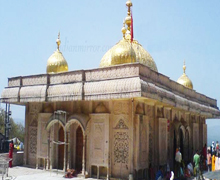 Hamirpur, 40 kms from Jwalamukhi, is home to many temples. 143 km from Dharamshala, Dharamshala is one of the various hill stations set up by the British to head to escape the heat of the plains. Located in the Chamba district of the Himachal Pradesh, Dharamshala is one of India’s most well known holiday destinations. 213 km from Dharamshala, Kullu is a famous hill station of Himachal Pradesh. Located at an altitude of 1220m, Kullu is also famous destination for the honeymooners who visit this place in great numbers. Raghunath temple, Jagannathi Devi and Jagannathi Devi Temple are famous attraction of Kullu. Located at a distance of about 45km from Kullu, Manikaran is famous for its Gurdwara, Shri Ramachandra shrine and hot springs. How to reach Dharamshala by Air: Kangra Airport in Gaggal, 15km from Dharamshala is connected by flights with different cites and places. How to reach Dharamshala by Rail: Pathankot, in the Indian state of Punjab, is the nearest Railway Station closest to Dharamshala and is 85 km away from Dharamshala. A narrow gauge train runs from Pathankot to Kangra which is 17 km by road. How to reach Dharamshala by Road: It is also possible to reach Dharamshala by bus or car. 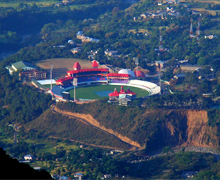 Dharamshala is 143 km from Dharamshala. Some of the cities and places connected with Dharamshala by road are Amritsar (188 km), Chamba (193 km), Jammu (197 km), Chandigarh (239 km), Manali (253 km ), Shimla (322 km) and Delhi (526 km ). There is plenty of accommodation available ranging from high end hotels to budget hotels and rest houses. Chonor House, Asia Health Resorts, Club Mahindra Resort, Clouds End Villa Cottages, Hotel Himqueen, Hotel Holiday Home, Glenmoor Cottages, Hotel Dev Cottage, Eagles' Nest, White Haven Estate, Grace Hotel and Norling Guesthouse are some of the accommodation options in Dharamshala.